Blacksburg, VA — All it takes are a few plays to change the complexion of a football game. When No. 6 Notre Dame (6-0) entered a frenzied sea of maroon and orange at Lane Stadium for the first time in the history of the program, it was looking to undo the ugly 1-9 record in true road games the past six years against ranked opponents. The Fighting Irish did exactly that, defeating Virginia Tech (3-2, 2-0 ACC) 45-23 in front of 65,632 fans to keep their College Football Playoff chances alive. The Hokies were looking to snap a streak of their own, but instead extended their losing streak to seven consecutive losses at home against ranked opponents since a 31-7 victory over No. 9 Miami in 2009. 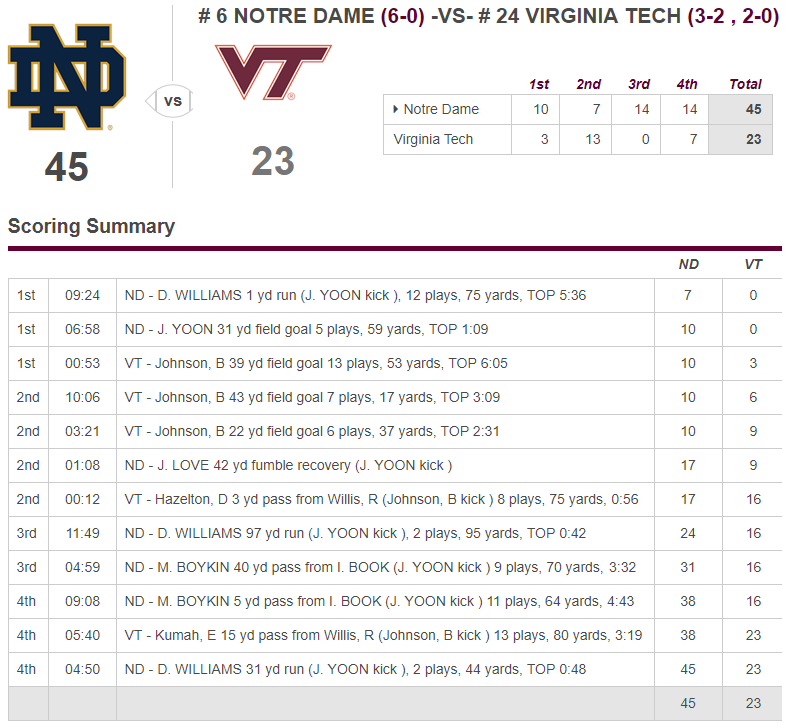 With Virginia Tech trailing Notre Dame 17-16 at the end of the first half, the Hokies came out on their first drive of the second half and stalled out at the Fighting Irish’s 42-yard line. Oscar Bradburn downed a punt at the five, and Virginia Tech appeared to be in a good position. That was until Notre Dame’s Dexter Williams busted a 97-yard touchdown on second down. A couple missed gap assignments sprung the play and gave Williams the longest rush in Lane Stadium history. Before the play, the Fighting Irish had 13 rushes for negative-three yards. Williams finished the night with 17 carries for 182 yards and three touchdowns. On the next drive, Notre Dame quarterback Ian Book found a wide-open Miles Boykin, who tallied eight catches for 117 yards and two scores, for a 40-yard touchdown. 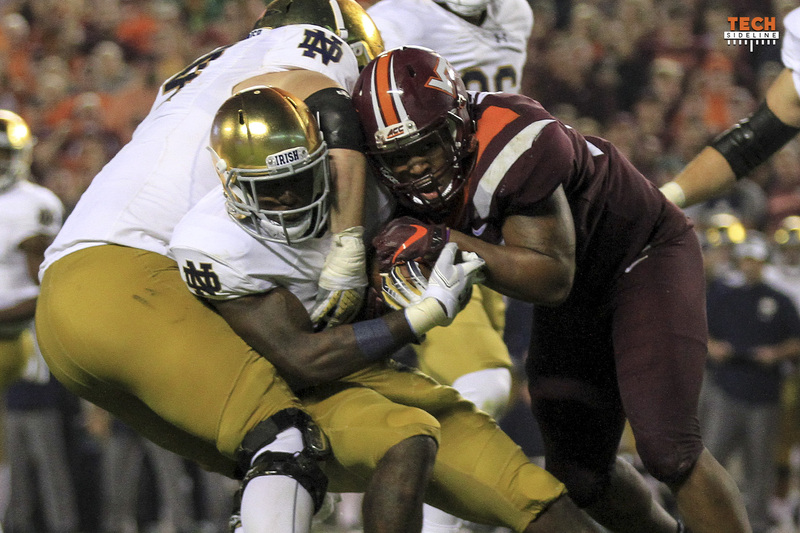 Notre Dame ripped off the first 21 points in the second half, quieting the crowd and leading to another Hokies’ defeat at the hands of a topnotch opponent on the national stage. Virginia Tech never led in the game. Book engineered a 12-play, 75-yard opening drive that was capped off with a two-yard touchdown from Williams. Trailing 10-0, the Hokies thought they hit a big play when Hezekiah Grimsley flew around on a reverse and tossed a potential 49-yard touchdown to Sean Savoy. However, Christian Darrisaw was flagged as an ineligible man down field. This big early touchdown by Sean Savoy was called back due to a penalty, and the Hokies fought an uphill battle the rest of the way. 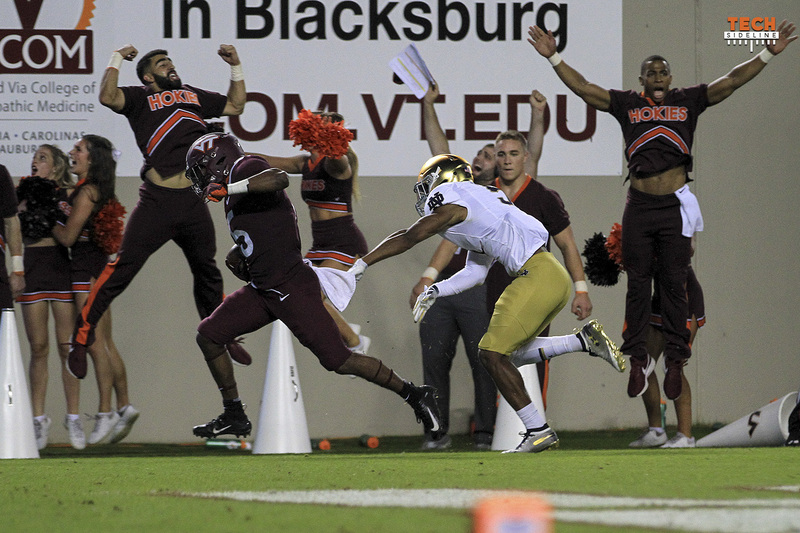 After settling for two field goals, the Hokies found themselves down 10-6 late in the second quarter, and Tech had the ball on the Notre Dame one yard line after a 41-yard run by Steven Peoples. Virginia Tech proceeded to be stuffed, including a botched handoff on third down that ended with Ryan Willis running into his own man. The Hokies made a field goal, but it was another singular play that made the Hokies miss out on four additional points in a crucial point of the game. It was Notre Dame’s defense that made the biggest play in the first half. Willis and Co. had another chance to grab a lead, but Willis rolled out to his right and was strip sacked by Khalid Kareem. Julian Love scooped the fumble and rumbled 42 yards for the touchdown to extend the Fighting Irish’s lead to 17-9. Willis ended the game 31-for-52 for 309 yards, two touchdowns, and two turnovers (one fumble, one interception). Wide receiver Damon Hazelton had a big night for the Hokies. The redshirt sophomore racked up 12 catches for 131 yards and a touchdown. It was Hazelton’s fifth straight game with a receiving touchdown, tying Isaiah Ford’s program record. Virginia Tech returns to action next Saturday on the road at North Carolina. Kickoff is scheduled for 7 p.m. and will be broadcasted on either ESPN2 or ESPNU. Free safety Divine Deablo did not play after “pulling up in practice” according to Fuente. Redshirt sophomore Tyree Rodgers started in his place. Ryan Willis threw for over 300 yards for the second consecutive game. He’s the first Virginia Tech player to do that since Logan Thomas in 2013. I prefer to look at ND and not us. Both their lines were outstanding. We have a pretty good D-line and couldn’t really pressure their QB. Their D-line pressured ours pretty good. They’re top five and we’re not. But don’t despair, more ACC coming up. All that meant very little in this game. 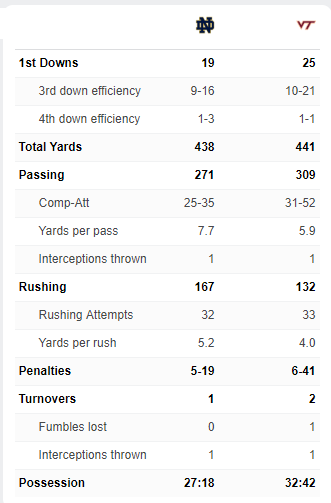 We had crazy penalties from Hoyt in the first quarter and were still in the game but it cost us points. Peoples running into Willis, Darrisaw just walking too far down the field brings back a beautiful TD, really bad gap assignments at the three yard line and another bad record is made in Lane which seemed to be the straw that broke the camels back. I put this on the coaching staff. These mistakes are first game mistakes!! Man downfield and facemask early on set the tone, unfortunately. Got to win the next game. Right the ship. We look young, time to grow up. I totally agree. Somehow I missed that before the game. 0-2 with him out of the lineup. Pretty obvious that Diablo is going to redshirt this year. Has the guy EVER been healthy? If Dealbo red-shirts we’re staring down the barrel of a 4-7 record. We’re 3-0 when he plays and 0-2 when he sits. Not a good formula. He redshirted last year. Rumor is its a hamstring and if thats the case he’ll be out for a few weeks.